DEBORAH CROMBIE: So you know it's officially FALL when pumpkins start appearing on porches (earlier and earlier...sigh) and thoughts turn to soups and chili and stews and quick breads and all those lovely cooler weather foods at which we've turned up our noses all summer. But it's really too early for pumpkin pie--not until we've at least got past Halloween--and I'm not even mentioning pumpkin latte (which I think is revolting.) So, naturally, our thoughts turn to pumpkin...ice cream. Is that weird? I don't think so. The thing is, last spring we got a Cuisinart Ice Cream Maker. This gadget is way up there on my Favorite All-time Appliance list. Maybe I'm a little late in joining the 21st century, but we were still using one of those ice cream makers that has to have ice and rock salt added all around the canister as it churns. At least it was electric, I'll give it that, but when it was running it sounded like an airplane taking off. The new ice cream maker is fabulous. You put your canister in the freezer for a couple of days. When it's good and cold, you stir together your ice cream mixture, then put that in the fridge for a couple of hours. Pour the mixture into the cold canister and pop it in the machine while you're eating. Voila! A half hour later you have delicious, finished ice cream. In a medium mixing bowl, use a hand mixer on low speed to combine the milk, brown sugar, and molasses, about 1 to 2 minutes. Stir in the pumpkin puree, cinnamon, ginger, and nutmeg. Add heavy cream and vanilla. (I do all this in my Kitchen Aid mixer.) Turn the machine on, pour the mixture into the cold canister, and mix until thickened, about 20 minutes. Add the crumbled cookies during the last five minutes of mixing. The ice cream will have a soft, creamy texture. I haven't tried this, but I have all the ingredients, so am going to give it a whirl (excuse the pun) today. What about you, REDS and readers? 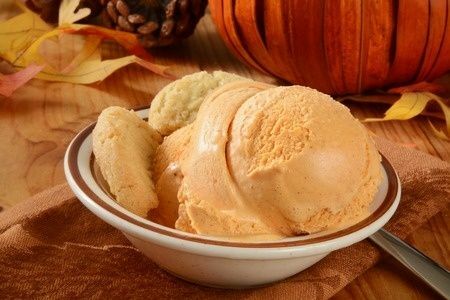 Have you made pumpkin ice cream? What gets you in the mood for the changing of the season? In a medium mixing bowl, use a hand mixer on low speed to combine the milk, brown sugar, and molasses until the sugar is dissolved, about 1 to 2 minutes. Stir in the pumpkin purée, cinnamon, ginger, and nutmeg. Add heavy cream and vanilla. Turn the machine on; pour the mixture into freezer bowl, and let mix until thickened, about 20 to 25 minutes. Add the crumbled cookies during the last 5 minutes of mixing. The ice cream will have a soft, creamy texture. If a firmer consistency is desired, transfer the ice cream to an airtight container and place in freezer for about 2 hours. No pumpkin ice cream [or latte] here, I'm afraid. There will be pumpkin custard later in the season . . . meanwhile, hot spiced cider is one of our fall favorites. The recipe is easy: apple cider, two or three sticks of cinnamon and few whole cloves in the crock pot. Serve warm; if you like, add a dash of Applejack . . . .
Hum, is it criminal to want ice cream for breakfast? Gotta check the statutes. Living in south Florida we take our seasons as we get them. Nothing is more thrilling than waking up one morning and discovering the humidity has abated. That's fall in Florida. Pumpkin products have begun making an appearance and Publix has those cute pilgrim salt and pepper shakers, but I'm afraid I'm not big pumpkin fan, except as a vegetable. Mashed pumpkin is wonderful. Kind of like mashed sweet potatoes with oomph. Have to put the Cuisinart ice cream maker on my Christmas list. Sounds like a necessary item, and I never heard of it before. Yikes. talk about stone age! fresh cider from the local orchard. Pulling out my winter recipes for pot roast, baked stuffed pork chops, and lasagna. OMG This sounds delicious! And a reason to welcome fall. I've never made ice cream at all. Though I've often made sorbet. Raspberry or grapefruit are the best. You basically puree the fruit, boil it with sugar and some amount of water, put it in the freezer and pull it out every 20 minutes or so and give it a stir until it's crystallized into a sorbet. It's yummy and there isn't a product out there that holds a candle to it. I'm with you, Debs, Pumpkin Latte sounds nothing short of revolting to me. But then, truth be told, I'm not a fan of pumpkin anything except seeing them sitting around during Halloween in their original form (with a face carved into it). Ice Cream! Oh, Laws. You're talking about my downfall. I do love me some ice cream and I am a fan of plain ol' vanilla. If it's good vanilla ice cream and not cheap imitation vanilla ice cream. I just go t pumpkin candles! And they smell wonderful. Pumpkin pie, yes, pumpkin ravioli, maybe one bite. Yes, it is suddenly FREEZING here! I have on a sweater, sweatpants and furry slippers. So happy you can't see me…:-) Happy Sunday everyone. Those Cuisinart ice cream makers are the best! We were given an old-fashioned, electric wooden kind for a wedding gift, in 1982. It still works, but it's so messy, with the salt and the chipped ice, that I rarely used it. The Cuisinart is easy, and not messy at all. A couple of years ago we had a bunch of watermelon that I grew, so I decided to try to replicate the watermelon sherbet we used to get when I was a kid in Hamilton. The old Sealtest dairy was right down the street, and on hot summer evenings Mother would walk us all down for a cone. I always chose the watermelon, because it was utterly delectable. So luckily the Internet had recipes, and I was able to make exactly what I remembered. It was a huge hit at bookclub! Pumpkin bars--with chocolate chips, walnuts, raisins--cream cheese frosting. Pumpkin pie, pumpkin ice cream--sure! Pumpkin to drink? Uh, no. Karen, will you share your watermelon sherbet recipe? I love your story of walking to the dairy with your mom. I'm not crazy about apple cider unless it's hard cider--although I'm sure if I could get cider straight from the orchard I'd love it. The supermarket stuff always tastes too sweet to me. For those of you who have Kitchen Aid mixers there is an ice cream maker attachment. I considered it, since I already have the mixer, but in the end went with the Cuisinart because the reviews were better and I'm glad I did. It's so easy and so good. The only thing is you have to remember to put the canister in the freezer 48 hours beforehand. I keep mine in the freezer most of the time. One of the first recipes I tried was salted caramel, but I have to admit I prefer the Simple Vanilla. Hard cider is my new "white wine", Deb! Especially Crispin, which is light and refreshing on a hot day. I think this is the recipe I used for the sherbet.It was in my bookmarks, at least. Usually, I copy and paste recipes I like into a Word file, but must have been busy then and neglected to do it. This one is from AllRecipes, by the way. Combine the watermelon, sugar, lemon juice, and salt in a large mixing bowl; stir to coat evenly. Cover the bowl with plastic wrap and refrigerator for 30 minutes. Pour the cold water into a saucepan. Sprinkle the gelatin over the cold water; let stand 1 minutes. Place the saucepan over low heat; cook for 2 minutes. Stir the gelatin mixture into the blended watermelon mixture. Add the heavy cream; beat with an electric hand mixer at medium speed until the mixture is fluffy. Transfer the mixture into an ice cream maker and freeze according to manufacturer's directions until it reaches "soft-serve" consistency. Transfer ice cream to a one- or two-quart lidded plastic container; cover surface with plastic wrap and seal. For best results, ice cream should ripen in the freezer for at least 2 hours or overnight. Ice cream for breakfast was a staple when the nieces and nephews spent the night, in the cereal bowl after cereal was finished. I could have introduced them to our college trick of ice cream on the cereal, but I wanted a little real milk in the meal. I like pumpkin in just about anything, just had pumpkin cheesecake cone at Baskin Robbins last week, and picked up some pumpkin spice cookie thins that are like ginger snap wafers . . . nice! It's starting to feel like fall here, but Hendrick's Barbecue is having a luau on their patio this afternoon. I might just have to put on my Hilo Hatty shirt and kukui nut lei and check it out, as a last hurrah of summer. The only pumpkin ice cream I've had is Breyer's, when they put out a special edition, and it's pretty good. I've never made ice cream, but I've eaten it, and homemade ice cream is delicious. I used welcome the fall season with baking a pumpkin pie, or actually two, as my recipe produces two pies from one can. With the kids grown and husband gone for work, the pumpkin pies don't make their appearance until Thanksgiving these days. As a huge Halloween fan, I start getting in the fall mood with the advent of fall and Halloween decorations and fall fairs. Yesterday a friend and I went to an art fair, where local artists displayed and sold their works, and I became fully engaged with fall and all of its wonders. I ended up buying a couple of fun Halloween prints and some other non-fall prints. I'm always amazed at the local talent, and I tucked away many business cards for future reference. 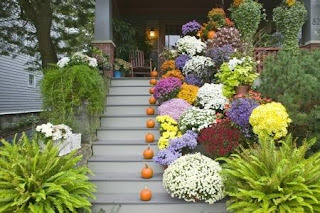 I did miss the Kuntz Fest in New Harmony, IN last weekend, which is a wonderful welcome to fall activity, but I'm looking forward to Halloween decorating in my house next week (if I have time while getting ready for Bouchercon). Debs, that recipe sounds lovely. Though I don't usually like anything pumpkin except an occasional slice of pie, heavy on the whipped cream. But now I think I'm pretty sure what John is getting for Christmas! And then I can try the watermelon sherbert too, and Hallie's idea of gelato. We had some pink grapefruit gelato in Rome that we've never found to match anywhere else. From the moment I saw the picture, I was all about pumpkin ice cream. I just received a Cuisinart ice cream maker as a gift from a friend who already had one and who knew that my family was currently using a rolling ball ice cream maker. Yes, it is supposed to be "fun!" I'll be honest, it is way fun for the kids for the first five maybe even ten minutes of rolling. After that, the rolling is up to me...not so fun. Anyway, thanks for the recipe. I'm ready to dive into it! Well first I have to clear a little room in the freezer. Steve and I had pumpkin ice cream yesterday! Delish! I had a dish of Pumpkin red chili Ice cream with a pecan caramel sauce at a restaurant in Santa Fe, NM years ago was delicious. Wish I had the recipe.